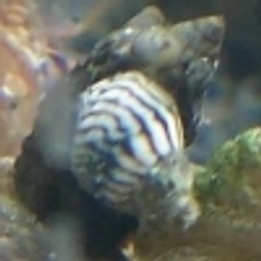 The Zig Zag Periwinkle will consume algae, detritus and diatoms on your aquarium's glass and rocks. They are small, growing to a size of only about a 3/5 of an inch at most. They should only be kept in a tank with a lid, as they have a habit of staying just above the water line. We have found them to be extremely hardy, the hardiest aquarium species that we know of, and an excellent addition to the aquarium that focuses on diversity. However, they are very small, and have little impact on algae. Since they are invasive exotic species in Florida, native to the Pacific, they make a good feeding species for mantis shrimp. Their collection is not only sustainable, but I think Fish and Wildlife would prefer we collect an unsustainable amount and remove them before they displace native species. If your shrimp has to eat snails, and you are going to let him eat my snails for some reason, this species is preferable to others.